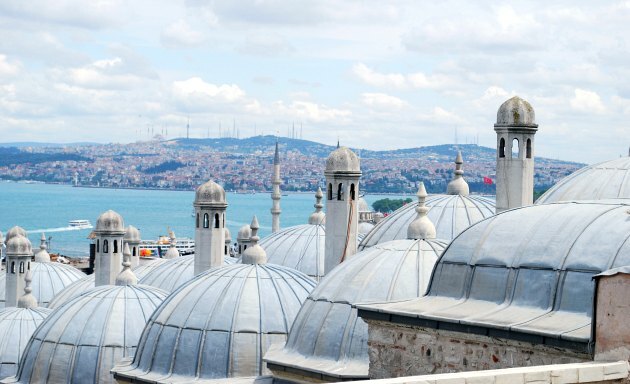 Süleymaniye Mosque stands proud on top of a hill overlooking the city of Istanbul. 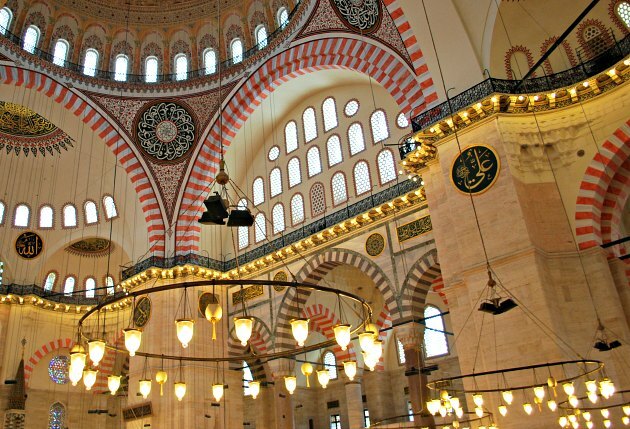 Construction began in 1550 on the orders of Sultan Süleyman and despite damage from a fire and an earthquake over the years, it still looks in superb condition due to extensive renovations which were completed in 2010. The grounds of the mosque are beautifully lawned, with flower beds in places and we’d recommend walking all the way around it before heading inside. You will need to dress appropriately to enter the mosque which means no shorts, no knees or shoulders on display and a headscarf for women. You will also need to remove your shoes, which you can place in the wooden holders around the wall. 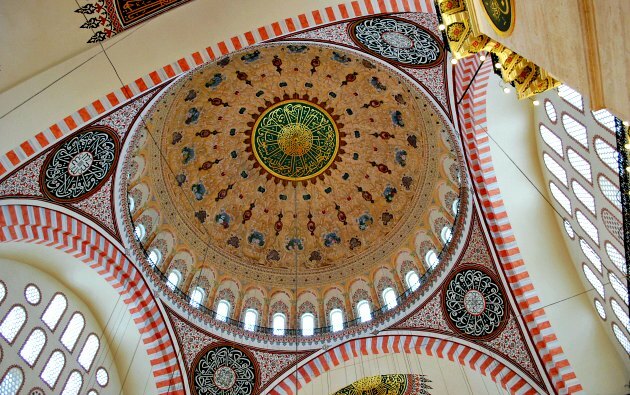 The mosque is simply and tastefully decorated with painted motifs picking out the huge dome and other ceiling areas. The wall of windows on each side throw lots of light into the worship area and when we visited there was a friendly attendant offering advice on Islam and notable features. The mosque is roughly square with additional domes on each side. We found it to have a calming and peaceful atmosphere and we stayed, just sitting on the carpet, for some time soaking up the view of the huge dome and pretty windows. The simple decor is continued with the mihrab (niche which points towards Mecca) and mimbar (pulpit) which are made from white marble. 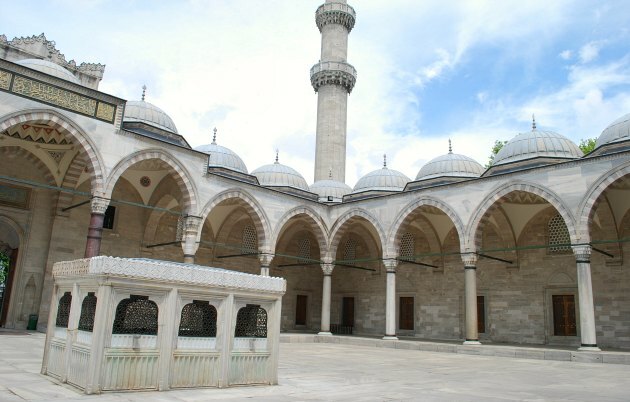 Apart from the prayer hall, the mosque complex also has several schools, a library, bath house and a refectory. 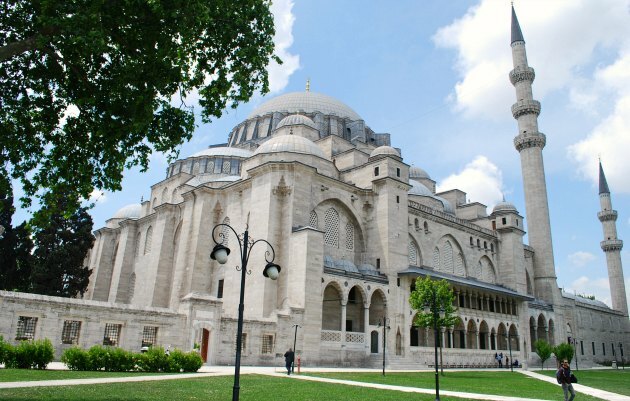 In the grounds of the mosque there are two tombs which you’ll find in the garden area for the Sultan Suleyman and Hurrem Sultan and their families. The most spectacular part of the 18 acre grounds though is the superb view over Istanbul. From the wall you can see the Bosphorus Strait and the Asian side, the Golden Horn, the Galata Bridge, the new city and the Bosphorus bridge. We were standing here at the lunchtime call to prayer and you could hear the whole city singing! Süleymaniye Mosque is near the University complex. We used the Beyazit tram stop to get here and walked alongside the university campus. By doing this you can avoid walking up the steep hill.